RULE #2: College Recruiting is a Process, Not a Privilege. Maintain quality contacts or you will get lost in the shuffle. 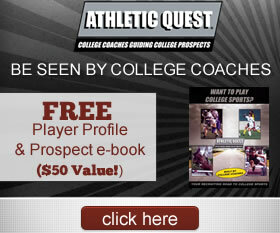 Click Here to Connect to College Coaches! COLLEGE SPORTS! A COLLEGE COACH CAN HELP WITH YOUR GAME PLAN! How many College Coaches have contacted you? If your answer is less than 5, it's simple. No one knows you're out there, you're not on anyone's recruiting list and most colleges don't have the recruiting budgets to come and find you. The average sport-recruiting budget for most College Coaches to find athletes nationwide is less than $2,000.00 per year! If you have not received dozens of letters by your sophomore year, your may not be a division I athlete! Almost 90% of all college opportunities are not NCAA Division I. There are over 2,000 colleges with athletic programs out there, you probably have not heard of most of them and guess what? They haven't heard of you either. How much money have you spent so far since the 8th grade on camps, tournaments, showcases or combines? Would you seriously consider investing in a few hundred to a few thousand dollars if you knew it would . . .
Help you receive a return of up to $50,000.00 to $150,000.00 for a four-year college education? Provide your son, or daughter with 5, 10 even 20 or more legitimate college opportunities? That's the power of ATHLETIC QUEST. If it is to provide every opportunity for your son or your daughter to get a better education, and to have opportunities to play college sports, then we have the right Game Plan for you. How can I get noticed by College Coaches? Have a proven game plan. Follow our road map built by College Coaches to take you down your personal recruiting road to college sports. All you need to do is choose the correct program for your needs, work with our resources and materials and use our #1 Rated college sports recruited website. It's that easy! If you're willing to invest in a proven program to help you get successful results, then AQ is right for you! For additional assistance, work with our winning team of former College Coaches. *ONLY COLLEGE COACHES are allowed to work with our student athletes. * We have had 100% of our Student Athletes that work with us receive multiple college opportunities!